BRITISH clubs swooped on a host of Australian players as well as a former England Rugby union international in the build-up to the second half of the season. The most notable signings were Parramatta pair, Brett Kenny (Wigan) and Eric Grothe (Leeds), and both would go on to prove massive crowd pleasers. John ‘Dallas’ Donnelly signed for Essex club, Southend Invicta and went on to play 17 games for the club, which was based at Roots Hall Stadium, near Prittle Brook. I’m not making this stuff up. The biggest crowd of the season was 504 for a match against Fulham. The lowest – 85 v Huddersfield. But they loved ‘Dallas’, who met them all individually. Fulham, who had tried to coax Wallaby star, Mark Ella out of retirement, had a season high 2,324 attendance at Chiswick for a match against Hull, and got down as low as 400 for a match against Welsh club, Bridgend. Meanwhile at under-21 international level, Great Britain played France in two ‘Tests, the first at Castleford and the return match at Albi. 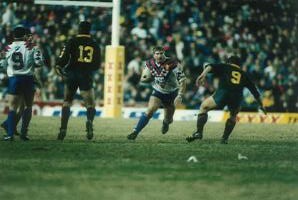 Britain won 24-8 at home and 8-2 away, with the likes of Shaun Edwards, Garry Schofield, Andy Currier, Lee Crooks, Roy Powell and Deryck Fox showing the form which would make them fixtures in senior international sides. Halfback, Giles Dumas from the St Gaudens club would go on to be the most successful French player.